If your opponent has Sarkhan or Gideon out and turns him into a creature, and you hit it with Dominate or Jabari's Influence (or if you have something that allows you to cast Blatant Thievery or Ritual of the Machine at instant speed). You get to control the creature, clearly, but am I right when I assume that you continue to control it after it returns to being a planeswalker at EOT? I'm also assuming that the various "You control enchanted creature." enchantments do not work that way, because the enchantment would fall off after it returns to being a planeswalker. Yes on all counts, for the reasons you detailed. This is also true for more temporary effects, like Act of Treason on a God, for example. Even if it stops being a creature after you gain control of it, the need for it to be a creature is only relevant for targeting, and Enchant Creature auras. Yeah, I kept the temp effects out of the question because they're only a delaying tactic in this case, since your opponent can only have it as a creature for your to take control of during their turn. If you take control of it during their turn with a temp effect, the best you're getting is a blocker. Having it as a planeswalker or an attacking creature is much better. Oh, yeah, it was just an example of something that came up in Theros, with the Gods floating around. Probably shouldn't have mentioned it. Just muddles things. Morphs (as a morph) are creature spells, right? Thus, you can cast Morphs with Ancient Ziggurat, right? MtGO wouldn't let me cast Zoetic Cavern as a Morph with it, but it would let me cast other Morphs just fine. Is that a bug or is that legit? 01/05/2012	No player can cast spells or activate abilities between returning the creature card to the battlefield and checking whether it's an Angel. 01/05/2012	If the creature is an Angel only on the battlefield (perhaps because it's a non-Angel creature card and Xenograft is on the battlefield), it will get the +1/+1 counters. 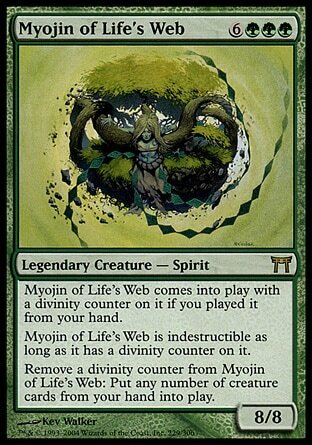 For the card "Myojin of Life's Web", does the ability "Remove a divinity counter: Put any number of creature cards from your hand into play" mean that you can cast creatures for effectively 0 mana cost? Prospero101 wrote: ...is it weird that I REALLY hope that someday I say something memorable enough to be quoted in someone else's signature? I'm trying this 'Twitter' thing, if you just want to send a message/question/joke, please send it to: @Valkyrie_Lemons , thanks! No. The cards are put directly from your hand onto the battlefield as a result of the myojin's ability. They are not cast and do not use the stack, much like Aether Vial. The creatures cannot be countered, although the ability may be Stifled. Enter the battlefield triggers will still trigger, but effects relying on the spell being cast, such as Emrakul's time walk, will not. JUDGE! If you use Balthor the Defiled's activated ability and choose for him to return to the command zone does it still work? I think for this to properly resolve he needs to be perma exiled. 117.11. The actions performed when paying a cost may be modified by effects. Even if they are, meaning the actions that are performed don't match the actions that are called for, the cost has still been paid. Commander rules say that when a commander is put into exile, you can put them in the command zone instead. This doesn't change they fact that you paid for the ability by attempting to exile him. Each creature that dies as a result of the Scythe of the Wretched will have their own triggers. You'll stack them in whatever order you believe works best, and they'll resolve in usual stack order. This means the creatures will enter the battlefield under your control one at a time, and each time the Scythe gets passed around like a baton until the last creature that enters gets it and it stays with that one. As for the second question, it depends on who controls the Scythe regardless of what side of the battlefield the equipped creature is on. If the Scythe is under your control then you would also control the triggered ability when creatures die to it and thus you will get the creatures when they return. If they die at different times (like, the equipped creature did damage to them, then something did more damage to one creature, and then something else did more damage to the other creature), they each come back when they die, and the Scythe gets attached to it each time. If they die at the same time (like in combat), they come back one at a time, and you attache the Scythe to each one in turn, before the next comes back. Between these, you have a chance to respond. You still control the Scythe, so the "your control" means you. You get the creature, even if someone else's creature has the Scythe equipped. Can I have Zurgo Helmsmasher and Zurgo Bellstriker on the field at the same time? What about Silumgar, the Drifting Death and Dragonlord silumgar under my control at the same time? What about if I had Jace Beleren and Jace, the Mind Sculptor on the field at the same time on my side? Legendary creatures care about card name. Zurgo Helmsmasher and Zurgo Bellstriker can exist on the field at the same time. Planeswalkers care about planeswalker subtype. Jace Beleren, Jace, Architect of Thought, Jace, the Mind Sculptor, and Jace, the Living Guildpact all see each other, and if you control two planeswalkers with subtype Jace, you'll have to put one into the graveyard. You won't be able to respond to this, as it's a state-based action, and will take effect before any player receives priority. Comprehensive Rules wrote: 704.5j. If a player controls two or more planeswalkers that share a planeswalker type, that player chooses one of them, and the rest are put into their owners' graveyards. This is called the "planeswalker uniqueness rule." 704.5k. If a player controls two or more legendary permanents with the same name, that player chooses one of them, and the rest are put into their owners' graveyards. This is called the "legend rule." ElFuzzy wrote: Can I have Zurgo Helmsmasher and Zurgo Bellstriker on the field at the same time? What about Silumgar, the Drifting Death and Dragonlord silumgar under my control at the same time? What about if I had Jace Beleren and Jace, the Mind Sculptor on the field at the same time on my side? An addendum to the previous (entirely correct) answer: Mirror Gallery is a card that they have printed - with a Mirror Gallery in play you could kick a Rite of Replication and make 5 copies of Zurgo Helmsmasher, and all of them would stick around to smash things for you, but turning off the legend rule won't let you get every version of Jace into play simultaneously because planeswalkers don't actually use that rule, they have their own. JUDGE! I'm curious about actually being a certified Judge since I am the designated one at my school and it will look good on my Resume. How does one start/go about said process? You should contact a lvl 2 or higher judge. You can do it directly or ask your tournament organizer or contact a judge living nearby through https://judge.wizards.com. On the website you can start studying for the exam by taking mock tests and also take the Rules Advisor exam. As a Rules Advisor you're kind of a level 0 judge and you can judge at casual events to gain experience. 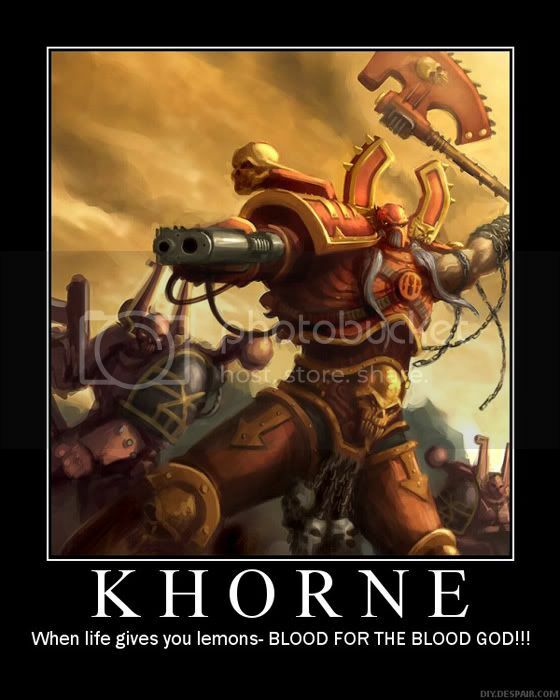 Once you contacted a judge about wanting to become a judge yourself they will usually talk you through the details and if you're lucky they'll guide you through the whole process, but everything is also described on Judge's Wiki Then you basically just start reading articles and the official rules, studying for the exam. When you feel ready you just talk to the judge and you appoint an exam. The exam itself consists of an interview and the written test. In the interview part you answer some rules questions and explain why do you want to become a judge. I have a question on how Zealous Persecution works. i just had a game where i had a Voice of Resurgence with 1 damage on it and my opponent cast Zealous Persecution. the Voice dies of course, but my opponent claimed that since i had no other creatures out, the token Voice creates when it dies, would also die, because the -1/-1 from Zealous Persecution was still affecting creatures on my side, even ones that entered the battlefield after the spell resolved. i claim it only affects the creatures on the battle field at the time the spell resolves. Not a judge but I'd say you are right, based on other interactions I've seen. I'm pretty sure it works like "Creatures you control [at the time the spell resolves] get blah and creatures your opponents control [at the time the spell resolves] get blah." Thus, newly-entering creatures after the spell resolves do not get blah. OK, so my own question, which is specific to MtGO. I'm pretty sure I heard somewhere that after the paper pre-release, the cards are legal in Standard (and other formats) on MtGO, even though they haven't been released on MtGO. Is this correct? The key point due to this is that DTK has 15 reprints. Seven of them were already legal in Standard and such due to being reprinted so recently. However, my question is regarding the legality of the other eight during that week or so. LokiTheLiar wrote: You should contact a lvl 2 or higher judge. You can do it directly or ask your tournament organizer or contact a judge living nearby through https://judge.wizards.com. Thanks, I just fully activated my DCI number and made a wizards account. I think I will start pursuing the Rules Advisor program to start. I'm not sure if I will continue to go to my current LGS and I don't know any lvl 2 judges atm.